I said here, that a writing forum has asked for my interview. Here we go guys. I'm feeling so thrilled and proud that I have no words to express it. It could not have been done without the support of you people. Thank you so much. I'm indebted to all of you. Read my interview for BlogAdda here. I READ READ READ..AND you very well deserved it milady! 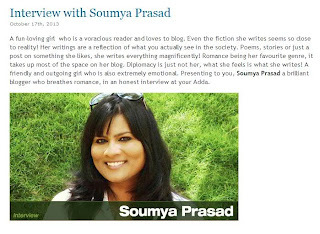 I loved the interview, it screamed Soumya with every word :) Congrats! You being there makes so many of us happy. We need our heroes. Congratulations.